For the major US-based K-beauty shops, it’s become a rite of passage to launch an in-house skincare line (or at least an exclusive product collaboration with a well known brand). It’s a pretty bold statement. Launching a house brand implies that the nearly inexhaustible variety of products already available in the market aren’t enough, that the shop’s vision is competitive with the established brands and formulations they already stock. Glow Recipe is the latest shop to make that statement. They sent me their Blueberry Bounce Gentle Cleanser and Watermelon Glow Sleeping Mask; the raucous jury in my head is still hearing evidence on the sleeping mask but has sent in a verdict in the case of the cleanser. The product featured in this post was gifted to me by the brand. Affiliate links in this post are marked with an asterisk(*) and pay me a small commission on purchases made using the links. I didn’t actually know I had the Glow Recipe products coming to me until I got a shipping notice from UPS about the package. 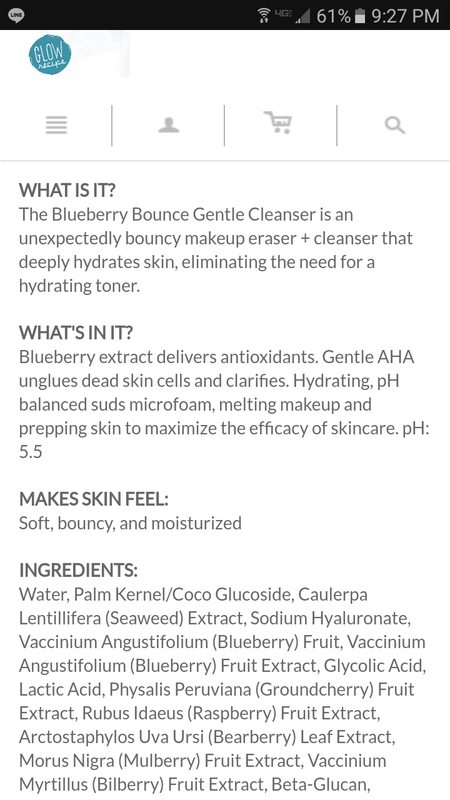 I also didn’t know how much I wanted to try the Blueberry Bounce Gentle Cleanser until I took a closer look at the product listing on the Glow Recipe website. pH 5.5! Or so it says. Purpose: Glow Recipe Blueberry Bounce Gentle Cleanser is a water-soluble foaming cleanser that claims to provide antioxidants while removing makeup, hydrating skin, and gently cleansing and exfoliating at a pH of 5.5. Best suited for: All skin types except very dry skin. Do not use if: You are sensitive to glycolic acid, lactic acid, anything else in the ingredients list, or foaming cleansers in general. When and how to use: Wet face and hands. Squeeze about a dime-sized amount of cleanser into palm and work into a lather. Massage over face. Rinse thoroughly. Can be used as a standalone cleanser in the morning, as a second step cleanser in the evening, or, if you really really want to (which I don’t), as a single-step makeup removing cleanser in the evening. Ingredients printed on the bottom of the box. 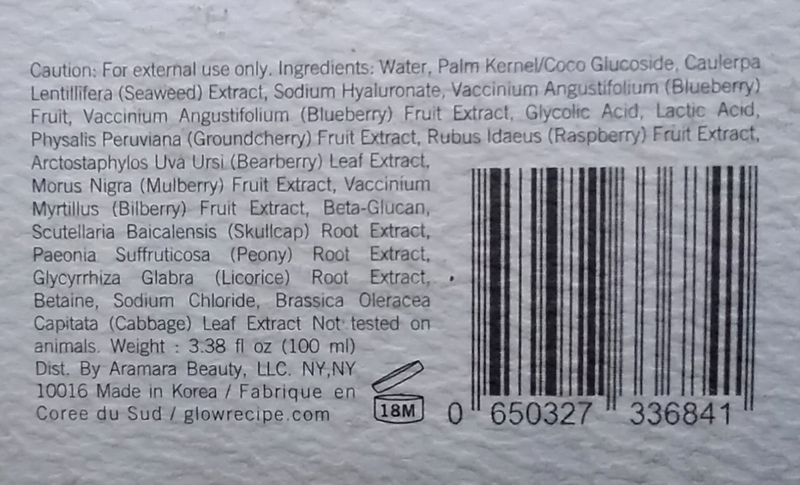 Notable ingredients: There are some legitimately appealing ingredients in this cleanser. I’ve been a fan of seaweed extracts for ages due to their fantastic emollient moisturizing properties, mulberry and licorice extracts are researched-backed naturally derived brightening agents, and there are actual bits of blueberries in here in addition to the blueberry extract. This cleanser also contains glycolic and lactic acid AHAs, hence the exfoliating claims on the website. Here’s the thing about fancy ingredients in cleansers. They sound great on paper and can give that cleanser extra entertainment value. I’m totally on board with the entertainment value if it keeps you doing your skincare routine even when you don’t feel up to it. But let’s be realistic. The entire point of a “cleanser” is that it “cleanses” and then you rinse it off. Yes, some cleansers may leave some ingredients on skin after rinsing, but for the most part, that’s not a feature to expect. When it comes to cleansers, expect cleansing. As for the glycolic and lactic acid, the effectiveness of chemical exfoliants depends in large part on their concentration and the pH of the product. I haven’t found the exact percentages listed anywhere, so my hopes aren’t high for a decent concentration. Serious exfoliants generally disclose their active ingredient concentrations. Remember the screenshot up near the top of this review that states the Blueberry Bounce Gentle Cleanser’s pH is 5.5? The consensus among several of us who have acquired and pH tested this cleanser is that it is most definitely not pH 5.5. Not straight out of the tube, not foamed with water. I tested my tube over several different occasions using my four-color pH testing strips*, which have always given me accurate results before. According to my strips, straight out of the tube, the Blueberry Bounce Gentle Cleanser’s pH is right around 7. This is in line with most other results I’ve seen. Tracy at Fanserviced-B uses a fancypants digital pH meter and got about a 6.9-7.0 when she tested the product. Other friends whose methods I trust and whose receipts I’ve seen are reporting results in a range of about 6.5-7.5. I’ve heard of at least one person who got a lower result when testing right out of the tube–between 5 and 6–but didn’t see that particular test myself. Things get a little weirder when water is introduced into the mix. 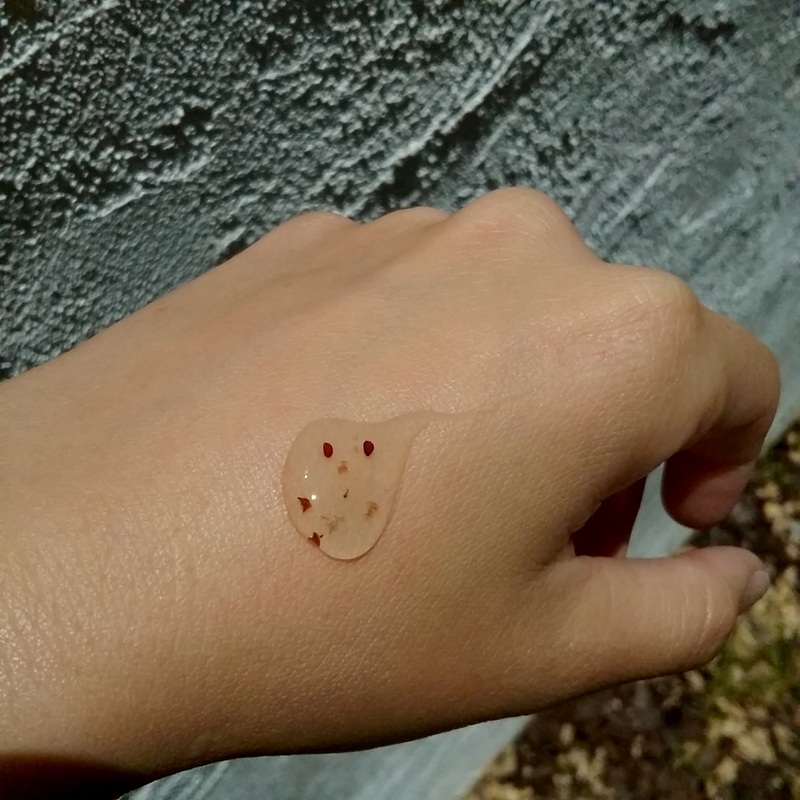 The first time I pH tested the Blueberry Bounce Gentle Cleanser, I used my tap water. My tap water’s pH can fluctuate, due (I presume) to other substances present in it (so appealing, I know). That day, my water was testing at about an 8, and the foamed-up cleanser’s pH showed higher than 7. Conversely, other people have reported that their lower-pH tap water has given them lower-than-7 results with this cleanser. I found the discrepancies strange, since I’ve tested plenty of cleansers in my day and not had issues like this. It’s my understanding that it could be an issue with the product’s formulation, potentially the way it’s buffered. Anyway, I grabbed a bottle of water, tested its pH (right around 7) and used that to foam up the product and test again. This time, I got a ~7. pH results when foamed with water. I personally don’t mind a pH 7 cleanser. It’s the highest that I’m comfortable with, but I’ve used several pH 7 cleansers without issues. 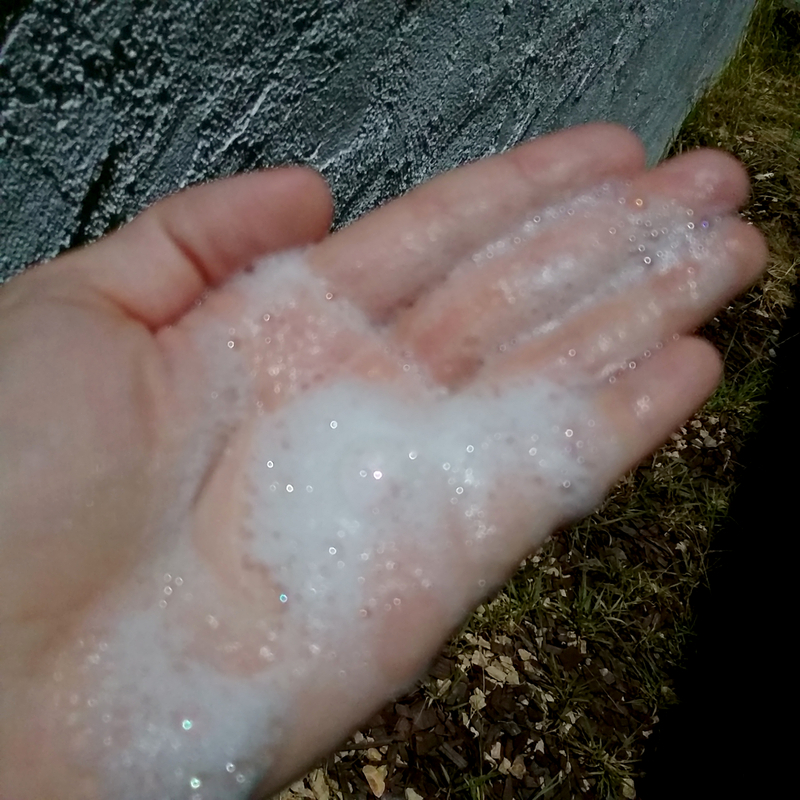 My beloved Sulwhasoo Snowise EX Cleansing Foam is about 6.5-7, and I would marry that cleanser if I could. I am, however, bummed that the Blueberry Bounce Gentle Cleanser’s pH doesn’t consistently test at the claimed pH. 5.5 is the standard for many low-pH cleanser fans, since it’s about what a healthy acid mantle would be naturally and is the value often given in discussions about cleansing’s effect on skin. 7 is fine for me, but 7 is not 5.5, and people often cite 5.5 as their specific cutoff point. The Blueberry Bounce Gentle Cleanser’s pH also means that whatever AHAs are present in this cleanser won’t do much to exfoliate, if anything at all. When it comes to exfoliating ability, 5.5 would already have been pushing it. Exfoliation and pH claims aside, this could still be a good cleanser, right? Sure. Of course it could! 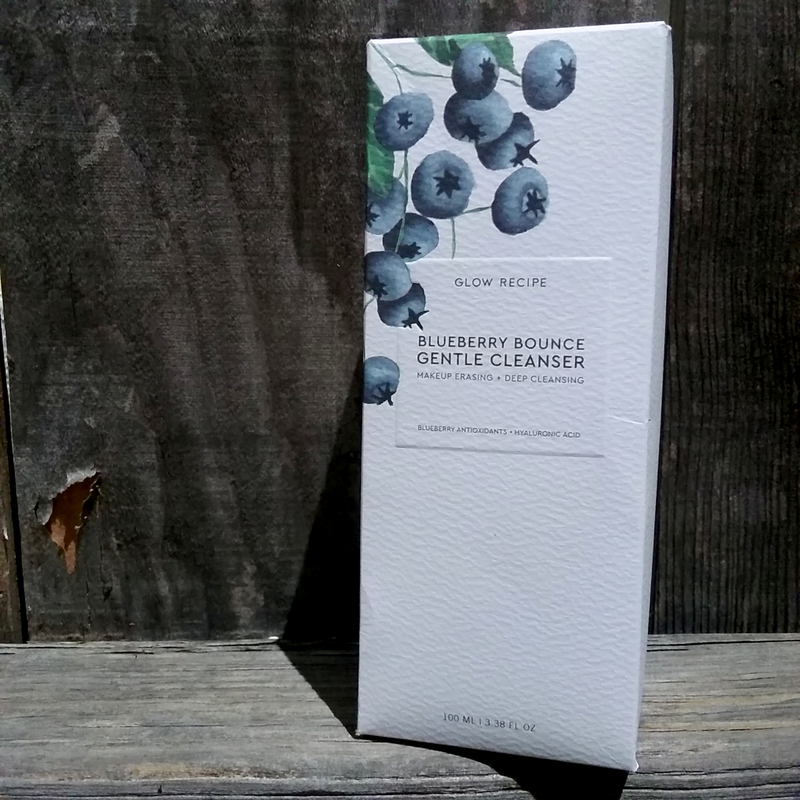 Glow Recipe Blueberry Bounce Gentle Cleanser is a thick, dense gel dotted with bits of blueberry skin that give the product a ton of extra visual appeal and entertainment value. 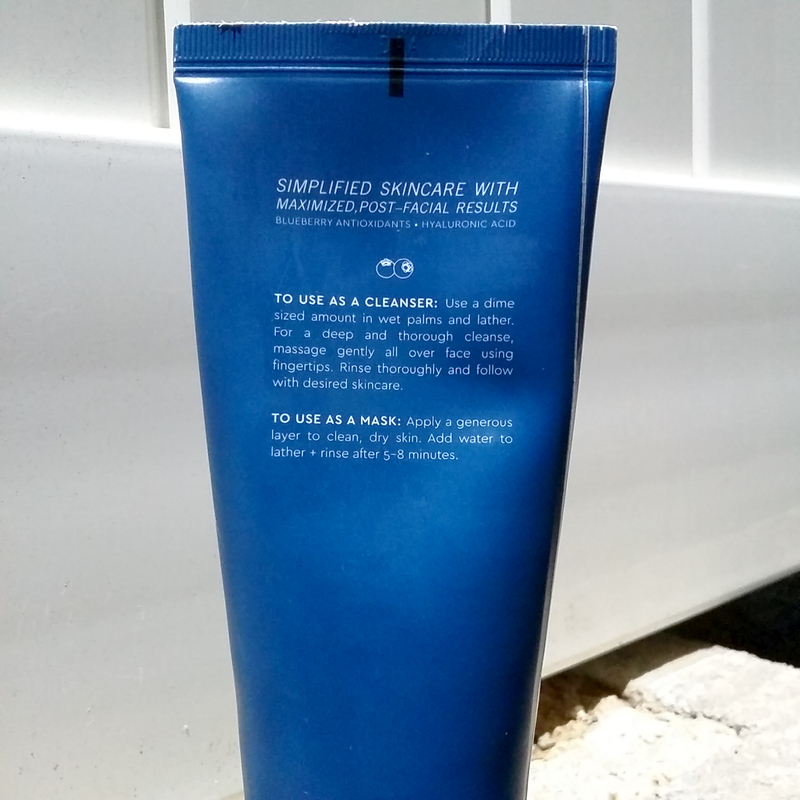 Straight out of the package, the cleanser smells delightful, exactly the way I’d expect a blueberry-themed cleanser to smell: fresh and fruity, but not overwhelmingly so. Then I mix it with water to lather it up, and the scent transforms into something markedly less delightful. Tracy mentioned the chemically smell in her first impressions, and another friend of mine privately likened it to the odor of bleach. I have to agree with the bleach description–that’s what the lather smells like to me. The lather is decent but not particularly lush or impressive. No mounds of fluffy, dense foam here, just loose suds that break down quickly on contact with skin. It takes quite a bit of product to work up a good lather, too. Foam made with about a nickel-sized dollop of product. Then again, it smells like bleach when lathered, so I suppose I can live with the minimal lathering. I received the Blueberry Bounce Gentle Cleanser late last week and have been using it twice a day since then, on its own in the morning and after cleansing oil as my second cleanser in the evenings. Each time, I’ve noticed something odd about this cleanser: it rinses off in two distinct stages. The first stage leaves my skin feeling soft, supple, and lightly hydrated, as the product claims to do. This stage also leaves a thin but noticeable film on my skin, though. If I continue rinsing and get the film thoroughly off my face, my skin feels ever so slightly squeaky and tight. Neither of these stages is ideal to me. This cleanser can feel hydrating if you leave that film on, but since I want my cleanser to leave my skin clean, I freaking don’t want to leave the film on. What if the film is mixed with some of the gunk that I’m trying to wash off my face? Rinse all the film off, on the other hand, and I’m left with skin that’s just a little too squeaky-clean for my liking. I choose the second option every time, because I want my skin to be actually clean and free of film and debris when I move on to the rest of my skincare routine, but I’m not happy about the squeaking and moderate stripping. My face feels fine after I’ve done a hydrating toner afterwards (the step this cleanser is supposed to enable you to skip! ), but my neck has been unusually dry and tight lately. It’s nowhere near the level of a really stripping, alkaline cleanser, but any noticeable dryness is suboptimal to me. On the plus side, the makeup removal claims this cleanser makes are actually accurate as far as I can tell. With some effort, the Blueberry Bounce Gentle Cleanser did completely remove a stubborn mineral sunscreen, a long-wearing lip liner, and my daily eyebrow pencil from my skin. The massaging this required left my skin feeling even more stripped and also a little raw, but in a real pinch, it does do the job. Just not in a way I’d ever want. Finally, the mask claims? I really don’t get this. 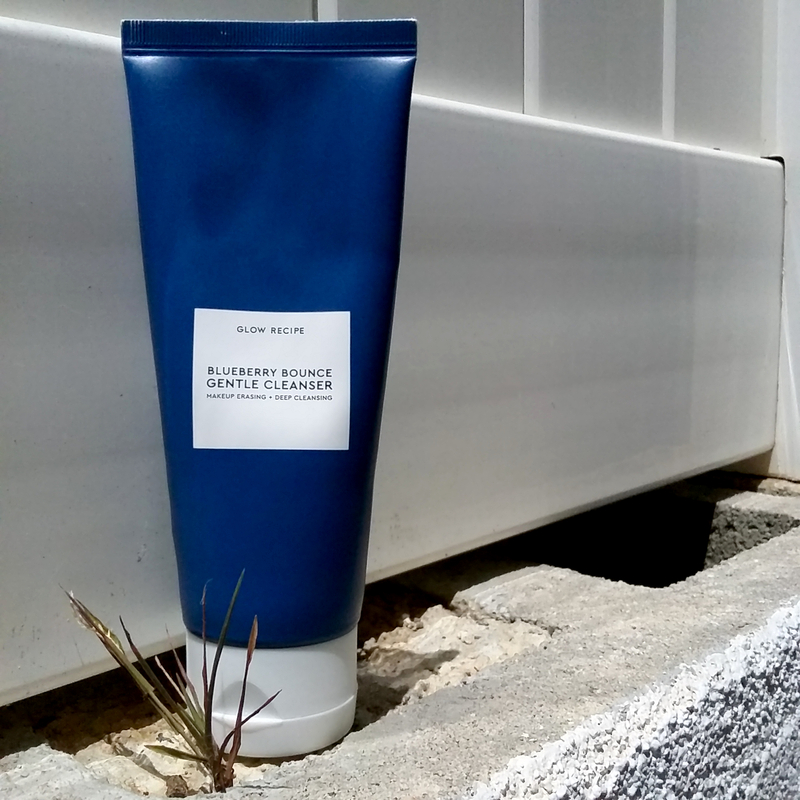 The packaging suggests using the Blueberry Bounce Gentle Cleanser as a leave-on mask by applying a generous layer to skin, letting it sit for 5-8 minutes, then lathering and rinsing off. Which…why? Why would one use a cleanser as a mask? For the antioxidants? For the hydration? For the questionable amounts of brightening ingredients? There are about a million other, more inexpensive wash-off masks that can provide the same things, without the potential stripping and irritation caused by extended contact with cleansing agents. It doesn’t work that well as a mask anyway. I tried it, because of course. The result after about 7 minutes was exactly the same as if I’d used the cleanser like a normal cleanser. Maybe I’d have noticed more of a difference if I’d left the film on. With the Blueberry Bounce Gentle Cleanser, I feel like the packaging is an eerily accurate representation of the product. 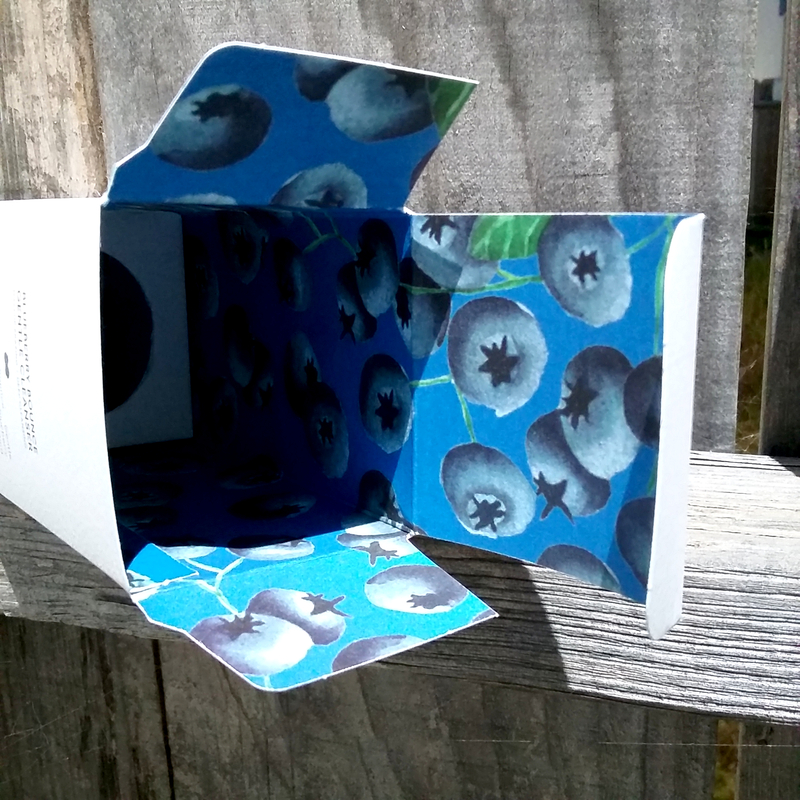 It looks nice–I like the look of the tube and the textured material and clean design of the box, and the blueberry-printed interior is a cute touch–but the cardboard feels flimsy and so does the tube, which started getting dented and deflated after less than a week of use. Similarly, the ingredients and claims for the cleanser sound fancy and fantastic, but its actual performance fell short for me. It’s a huge bummer, especially given my personal fondness for the Glow Recipe founders. Conclusion: This is a luxury-priced cleanser that failed to provide me with a luxury experience. I have no problem with ‘spensive face washes as long as they cleanse gently but thoroughly and deliver a suitably lush experience. 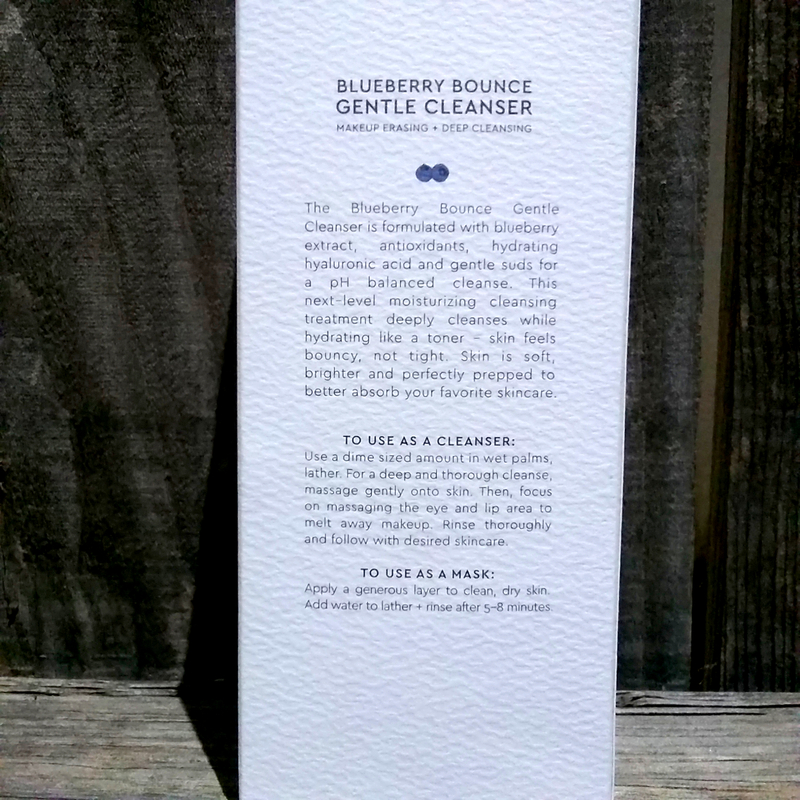 The Blueberry Bounce Gentle Cleanser doesn’t do either to the standards that the price sets. I don’t hate it enough to relegate it to the “brush and puff cleanser” pile, but I definitely don’t love it enough to want to get more once it’s done. Pretty good. Would buy again unless I find something better. Want a blueberry-themed cleanser that does test at about pH 5.5? Innisfree makes one*. I’ve tried it and actually found it a bit too bland and moisturizing for my tastes, but it’s a perfectly acceptable cleanser at an affordable price. Want a splurge cleanser that smells amazing from tube to face, generates a mound of thick and cushiony lather, rinses clean, and leaves skin soft and supple but without residue? Sulwhasoo makes my all-time favorite*. The pH is between 6.5 and 7, and the scent is fresh and herbal, like a lush pine forest. Thanks a lot for this great and useful review, as always! What do you think about Lagom “Cellup Gel to Water Cleanser” and Make p:rem “pH 5.5 low-irritant and mild acid foam”? 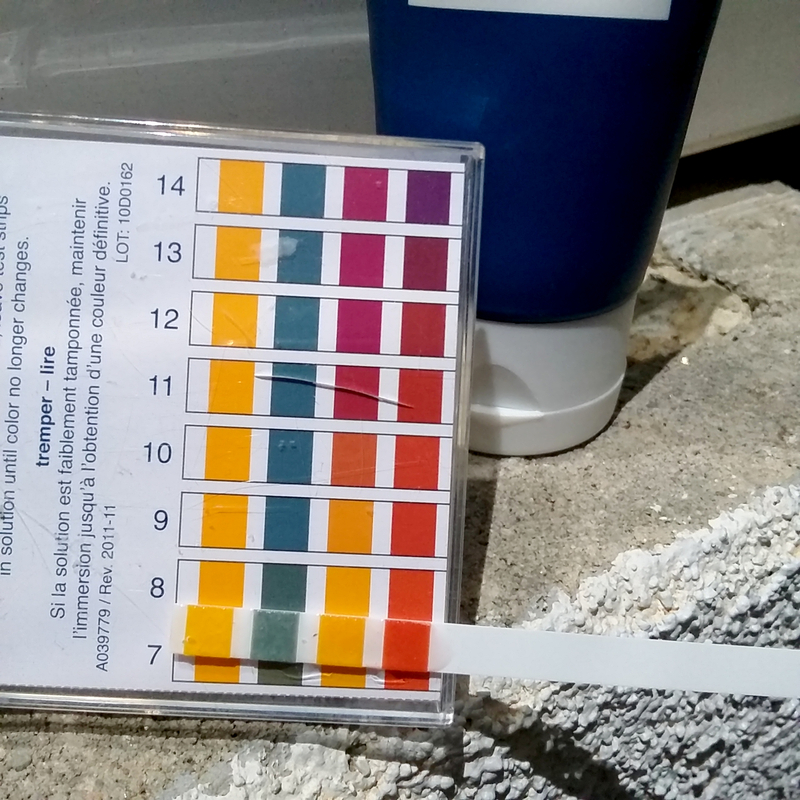 Some people reported the pH of both cleansers is around 5 – 5.5. I wonder if they changed something since it first came out. I have been using it just this past week, and I am sort of obsessed with it. I love the scent and my face feels clean, but not dry (it definitely takes a lot of water to rinse it all off though). I don’t have any ph strips, so I couldn’t tell you about that, but I really love it – even though it should be at least half the price.